One of White City's earliest homes- (1923) by Rig Hansen one of White City's early danish settlers. Dade pine, Handcrafted trim in Magnolia, Poplar & Ash woods, cascading staircase. Fireplace & beautiful hardwood floors. This quality home is solid and has weathered years with dignity & charm. 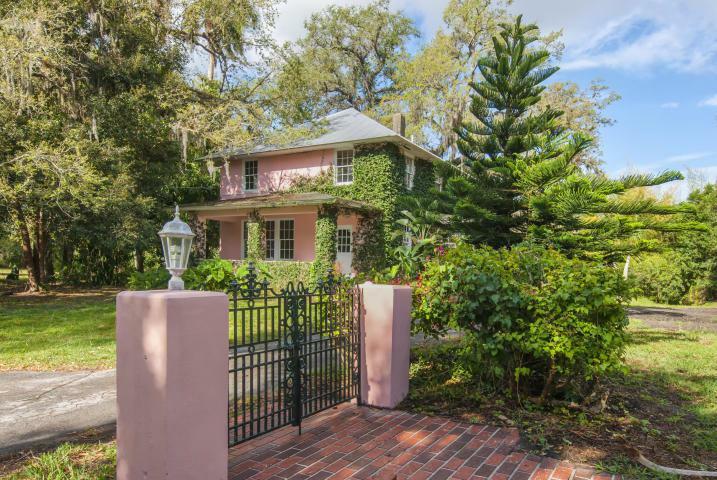 Surrounded by magnificent trees & a fish pond with fountain..The original home is one of White City's earliest homes- completed in 1923 made of Dade pine. It was built by Rig Hansen who is one of White City's early Danish settlers. A lovely cascading staircase is hand turned and is a great example of quality work. All windows are original to the home with the exception of the bathrooms. It has the original fireplace and beautiful hardwood floors upstairs and down. The handcrafted wood trim is Magnoli, Poplar and Ash woods with minimal nail work. This quality home is solid and has weathered the years with dignity and charm! A simple open floor plan and great natural light are a bonus to this secluded home. Many historical White City events where celebrated in this home. Local celebrations and the former Country Gardens Florist and Orchid hot houses where located on the property for years. Beautiful shrubbery, blooming naturally from the indigenous plants grow on the banks of the St Lucie Rivers' edge, at the rear of the property, is a true hallmark of Old Florida. True Florida wild life remains on this rare large parcel of highly desirable White City.